In a world cluttered with advertising pitches, when a company can get prospects to click on links, watch their videos, join their email or SMS list, and attend webinars they have succeeded in getting them into their marketing funnel, keeping them in it, or advancing the sales process to the next phase. 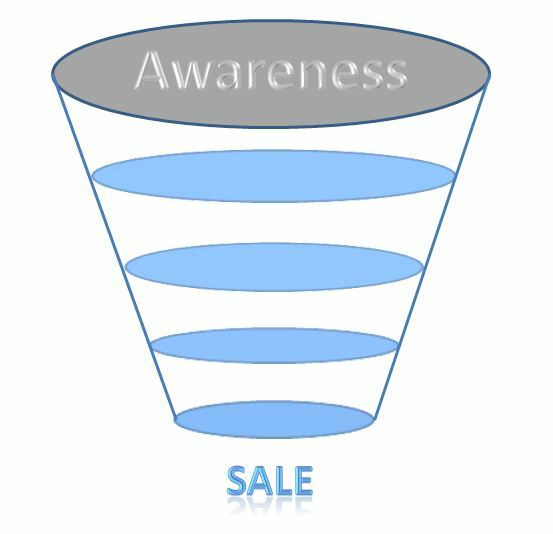 How do you get prospects into your funnel, and keep moving them closer to making a buying decision…? Only deliver highly relevant content using the most appropriate methods of delivery, and communicate with them as infrequently as possible, but as often as necessary to advance the sales process without fatiguing them. It is essential to first understand your customers needs and their purchasing criteria. From this point you are able to develop a systematic approach to delivering content which will move them closer to realizing that your products or services will add value for them. Next you must choose the best methods to communicate your value proposition. Is it important to deliver my information in separate phases, or is it better to reduce the volume of information and ask prospects to make a purchasing decision more quickly? It depends on what type of product or service you sell. For larger and more complicated purchasing decisions it is often better to develop a stage oriented sales process. We recommend beginning the process by using a blog, videos, podcasts and/or other web content to engage the prospect while establishing your business as a GREAT solution to their needs. From this point the sales process will depend on what type of decision you are asking them to make, and what your sales and marketing resources are capable of executing. At what stage in the sales process should a representative from your company engage the prospect directly? For most companies the answer is to establish a personal connection immediately after the prospect’s first interaction with your content, however some companies choose to have the prospect define their level of interest and how close to “sold,” they are by asking them to take another action or by presenting them with multiple options that allow them to define where in the sales process they currently are. We receive requests from companies who have “decided,” that they want to use a specific medium like email, SMS or Video as part of their tactical marketing communications mix. We have found that it does not usually have a beneficial impact on sales to introduce a new tool without understanding it’s role in the overall context of your sales and marketing campaign(s). If your customers don’t regularly use the method of communication you are choosing, then you will see poor performance results. We recommend considering fully whether a new tool is actually the best available alternative to communicate with your audience prior to acquiring or using it. Good relationships require mutual trust and good communication. The described “status,” of a relationship is a direct reflection of it’s quality in the view of the person describing it. Imagine spouses communicating with each other exclusively via email, text message, or on their social network profiles… It is hard to imagine a healthy relationship surviving exclusively in this sphere. Most business relationships aren’t any different. If you communicate with someone exclusively via email, text message, instant messenger, etc., what type of quality do you really have in the relationship? In an increasingly hectic and demanding professional world, we can all benefit from using online means of interaction to improve our ability to communicate more frequently with our relationships. However, we must also be careful not to forsake the value of offline interaction. Quality in our customer, employee, and vendor relationships benefits from personal conversation, periodic face to face meetings, or a social activity where goodwill and trust are built and maintained. 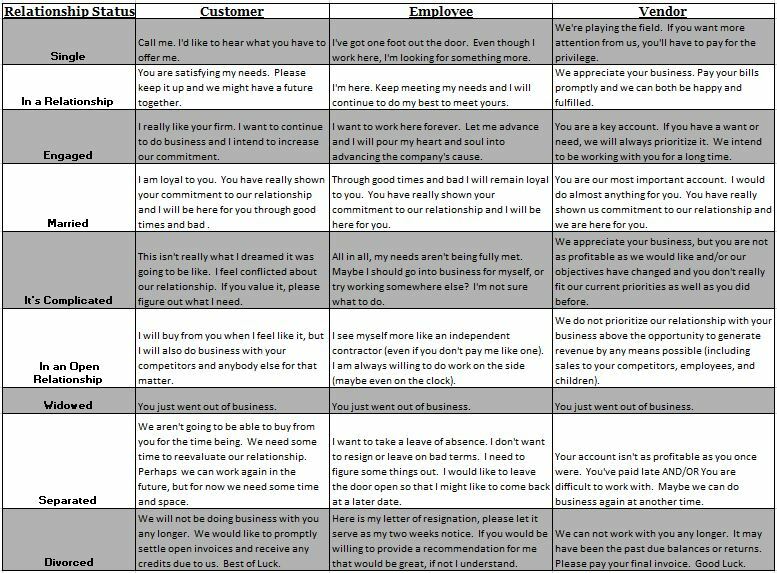 What if our customers, vendors, and employees had their business relationship status with us openly displayed for review? What would it say? What if we relied so heavily on online communication that this became our best chance of really understanding their perspective on the quality of our relationship? Don’t be so busy that you let the quality of your relationships suffer. Pick up the phone and tell someone that you appreciate them or that they are doing a great job. Better yet go see them in person and tell them face to face. Invite someone you care about to do something fun or interesting with you. Take some time to get to know somebody better and begin a great relationship. These actions create memories for both of you. 2011: Opportunities to Increase Revenue and Profitability. In 2010, we conducted an exhaustive survey and study of 400 businesses. We asked questions aimed at recognizing trends that would help to identify the strongest opportunities for businesses to increase their revenue and profitability. Respondents were Owners, Executives, and Management including client companies, prospective clients, and many others with whom we have no affiliation. Participating businesses included 175 small businesses, 175 mid-size companies, and 50 Large/Enterprise Organizations. With all data collected and analyzed we have concluded that there are significant opportunities in 2011 to increase both revenue and profitability. 94% of Small Businesses reported that they strongly feel the need to diversify their marketing methods to be competitive. 68% said they have not done so due to both budgetary AND time constraints. An additional 26% cited either time OR budget alone as the reason they had not done anything in the past 12 months to change their marketing mix. 68% of Mid-Size Companies reported that due to funding concerns they were forced to slash their marketing budgets in 2010. 100% of these companies reported that they needed to use Social Media to be more competitive because of their cutbacks on other marketing. 82% of Large/Enterprise Companies had evaluated and/or implemented both mobile marketing and/or social media in conjunction with their existing marketing communications strategy for 2010. 78% of this group indicated that additional investment would be made in these channels during 2011. 96% of restaurant and retail businesses reported that Mobile Marketing (SMS Couponing, and Geolocational Promotion), along with Group Buying (Groupon, Living Social) were of significant interest to them. However 86% had not taken direct measures to leverage these methods in 2010. 50% indicated that they intended to reinvest some of their marketing budget to incorporate either or both of these methods in 2011. 83% of Consumer Financial Services (Insurance, Banking, and Investment) companies indicated that they continue to address significant concerns, hesitancy, and reluctance in dealing with new prospective customers which they attribute to a marked shift in consumer sentiment due to negative publicity enveloping the entire industry. 54% of companies participating in the study felt that despite intense pressure to reduce their costs during the past 36 months; there were still significant savings opportunities that could be realized in areas that they simply hadn’t justified investing time or resources to investigate properly. In 2011, we are deploying a series of scalable services targeted by company size, industry, and geography. Client companies implementing these strategies increase revenue and profitability while maximizing their resources. In a world of increasingly competitive social, personal and professional environments we are presented with a heightened challenge to measure and protect both our business and our personal reputations. Can we ensure that we will not be accused of something that might damage our reputation? No. Can we monitor and protect ourselves from this type of risk? Yes. Type “reputation management,” into a search engine and you will find results linking to articles, consultants, and technical services providing advice and assistance with protecting or repairing your “image,” on the internet. It goes without saying that your internet presence is certainly important, but your reputation depends on more than its appearance on the internet. Reputation management should be proactively oriented and addressed as part of your comprehensive business continuity plan. When you are in a leadership position, you bear a significant responsibility for the decisions and actions that you make, but also for those made by people in your charge. When you have been given the trust and responsibility that comes with leadership, you must be certain that you lead by example, and maintain a high level of awareness to the conduct of those who you lead. One action or decision could mortgage or bankrupt your reputation as a leader, or even the reputation of your entire organization. If misconduct on the part of a team member were to have legal consequences those might pertain only to that individual. However in the court of public opinion, blame and responsibility have a more common tendency to be attributed to entire groups, and even more so to the leader. Reputation and word of mouth have always been important, with the rise of social media and hyper-communication, the stakes are even higher. Word of mouth simply travels much farther, and much faster than it ever has before. Prominent leaders who stand accused of wrongdoing often proclaim their innocence, or attempt to explain themselves only to have their words fall on deaf ears. These stories spur discussions which are often hot topics in both traditional and social media channels. In some cases allegations are proven to be legitimate, while in others even the most heinous of allegations are proven to be false. The problem is that even when somebody is absolved of blame often the conversation or media focus has moved on to other matters, and the individual and/or organization is left to deal with significant residual damage to their reputation. The Washington Post featured a story about Sue Scheff a consultant to parents of troubled teens. In short, Sue Scheff lead a small business where her name was essential to the business brand. In 2003, a parent posted negative remarks on her organization’s website, which defamed her character and injured her reputation. The injury to her reputation had serious personal, financial, and business consequences after negative remarks went “viral,” Sue had been Google Bombed. It took years, but Sue was diligent in reclaiming her reputation, today her business appears to be alive and well, and she authored a highly acclaimed account of her ordeal titled Google Bomb: The Untold Story of the $11.3M Verdict That Changed the Way We Use The Internet. It would not be an understatement to say that most businesses or individuals would not have survived this type of ordeal nearly as well as Sue eventually did. How do you determine what (or who) may be a legitimate risk factor? It is certainly not productive to spend too much time or focus dwelling on every eventuality or possible risk since there is no way you can guarantee that allegations won’t be made against you. While valid, this reasoning unfortunately is commonly used as an excuse for not asking pertinent questions; with answers that may require making difficult decisions. Failing to ask such questions not only makes you more vulnerable to attacks on your reputation it can also have profound effects on your culture and performance. 10 questions to begin your thought process or to start a dialog with your leadership team. Are personal values consistent with organization values? Is it possible to maintain a separate identity in our personal and professional lives? Do we always do our best to promote morality both in concept and action as individuals and leaders? Which practices/policies might hurt, frustrate or anger customers/members, employees, partners, or vendors? Is poor conduct ever “accommodated,” because of an individual’s role in the organization? What steps can be taken to improve our current level of awareness to our individual and collective reputations? What (or who) are the greatest risk factors in improving or maintaining our reputation? What immediate steps can be taken to prepare for an attack to our reputation? What further measures should be considered to be protected. Are we properly prepared to effectively respond if faced with a serious challenge to our reputation?